We woke up very early to get a shot of Angkor Wat Complex. Now a major tourist destination, this temple perhaps is one of the most complex religious icons left in the world. The complex is huge. It would take you a week to fully explore the complex. 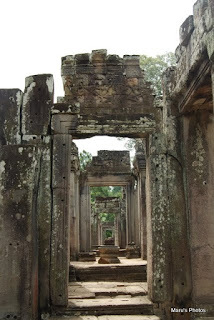 One interesting temple is the Bayon Temple. The temple is a sort of contradiction in Cambodia. The two most visited sites in Cambodia are the sites related to the Cambodian Khmer Rouge period and Angkor Wat which was a cornerstone of a vast Khmer empire. I'm not going to explain the history and the development of Angkor Wat. For that, you can go here or here for K-12 materials. When you talk to Cambodians about Angkor Wat and the various temples, there are a number of broad contradictions going on. It is a religious site. Like many wonders of the world, the root reason for its construction is religious. The problem is the commercialization. It is true that you need tourism to help out with the economy. Siem Reap is one of the poorest sections of Cambodia, so the tourism does help. The problem is when you arrive as a tourist, there are aggressive sellers of everything from post cards to musical instruments, etc. The experience gets convoluted as far as who controls the tourist industry in Siem Reap. The Japanese, Chinese, Koreans and Vietnamese have all heavily invested into the area. Because of the proximity to the Angkor Wat temple complex, you see a wide range of hotels in the city. Most Cambodians can not book a room in the hotels, but they do certainly work in them. For a one day pass, it will cost you 20 American dollars. It's not exactly cheap. It seems that someone is making the money, but I'm not sure if it is getting reinvested in the complex or going to other pockets. Angkor Wat is actually a huge complex. It is several kilometers in length, and it contains a number of temples scattered throughout the area. Banyon Temple is the first temple that we visited. Constructed in the 13th Century, it had a number of interesting passageways and corners. What is strange is that you are allowed to walk into the temple, even though it is a sensitive site. Amid the ruins of a temple, you will get accosted by tourists from all parts of the world, and the ever present vendors. Vendors in Vietnam are rather aggressive, sort of like in Cambodia. Thailand's vendors are more subtle, but then there are other scams that often go on. This is a wide angle shot. I like my wide angle on my Nikon as it captures a huge swath of the landscape. What is the Bayon Temple. Well, it is obviously a hybrid of Buddhism and Hindu in iconography. It is heavy Hindu influence. Like many parts of South East Asia, the Indian Hindu influence is very prominent. This become obvious in the way people even great each other in Cambodia and Thailand by putting your hands together as if in prayer. It is known as the wai in Thailand. Technically, the original religious ideology behind this temple is Mahayana Buddhism. Most of contemporary Cambodia would be Theravada Buddhism. As you can tell, the complex is very old. Most of Angkor Wat predates most of the European empires. It was a very civilized society with a complex irrigation system which allowed for the production of rice and produce which would be necessary for the development of a stable economic profile. According to many historians, the fall of the Angkor Empire began with the decline in the construction of these religious complexes. The images embedded in the walls are remarkable. The one problem was trying to get a photo without some tourist walking by or someone trying to sell you something. Indeed, this is the duality of the Angkor Wat Complex as evident in the Bayon Temple. There is ancient beauty, and a weird cheezy aspect to it. I got caught in a con. Once you take a photo of someone, they get you by saying that you have to pay. Well, I basically went along with the entire messy exercise. I also considered the photo to be evidence of a complex relationship between the ancient site, and commercialization. Between all the walls is a question. When is the use of an ancient site good for the country? Can a country really use ancient sites without the potential issue of damage? Cambodia for the most part has seized the moment with the Angkor Wat complex. On the other hand, the commercialization of it all bothes the heck out of me.